Boone Central/Newman Grove’s volleyball team rebounded from a loss to Guardian Angels Central Catholic last Thursday, and another defeat at the hands of Crofton in the opening round of the Boone Central Invitational, to win two straight matches and place 5th in Saturday’s event. Cardinal Coach Susan Roberts noted that her team made some adjustments following Thursday’s contest, and she was pleased with the results in the tournament. 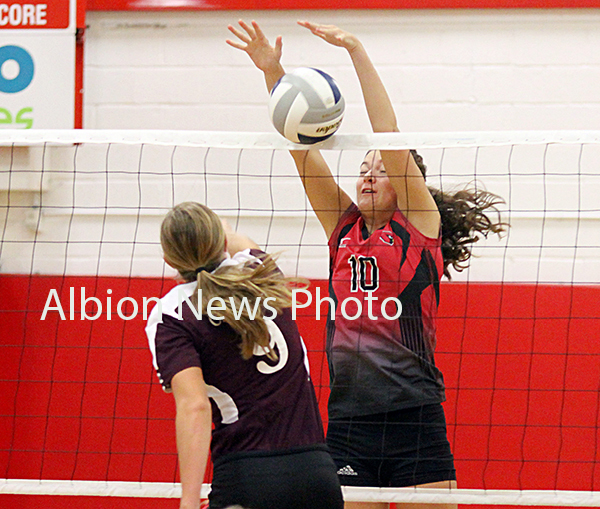 “We had a pretty sluggish performance against GACC. We weren’t able to generate much from an offensive standpoint, which left GACC in system and left us playing a lot of defense,” Roberts commented. “So, we changed up a few things in practice Friday and came out with better focus and execution right from the start Saturday. Boone Central/Newman Grove entertained Guardian Angels CC at Newman Grove, with the Bluejays claiming a 25-16, 25-21, 25-19 victory. Nicole Woebbecke had four ace serves for the Cardinals and Karley Zoucha added two. Zoucha and Jenna Kramer each had six kills, while Kelsey Thompson delivered 17 set assists. Woebbecke was the dig leader with 10. Boone Central/Newman Grove began play in Saturday’s tournament with a 22-25, 25-19, 22-25 loss to Crofton in a competitive, back-and-forth match. Zoucha led BC/NG at the net with nine kills. Woebbecke and Carsen Grape added five apiece. The Cardinals edged Central City 27-25 to begin consolation play, then blitzed the Bison 25-17 to complete the victory. Zoucha led a balanced attack with four kills. Tessa Hedlund, Kramer and Woebbecke each contributed three. Mya Donelson paced the defensive effort with nine digs. BC/NG made it two straight 2-0 wins with a 25-18, 25-11 decision over O’Neill. Kramer controlled the net with seven kills and two blocks. Thompson had 14 assists and four ace serves.